all of a sudden I feel hungry! I love the clever way the designer has brought out elements from the couples interest. I assume they are Welsh with a love of roaming in a VW camper van and enjoy the coast. ;-) I will refrain from commenting on the photography as I am not sure that was your intent. If you do,, next time stick it in the open critique area. 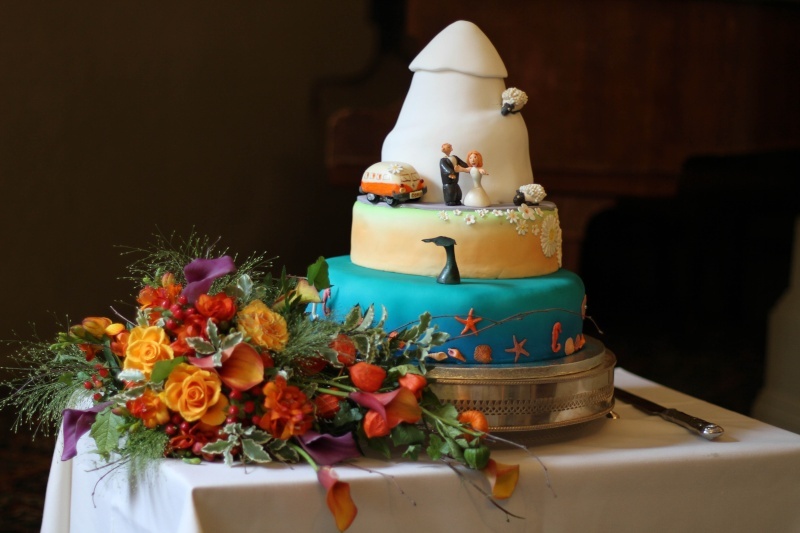 It is my daughters wedding cake, they spent a year on a world travel best part of which was in New Zealand in a camper van. I took this without flash, I was unsure weather to use flash or not. You only get one chance to get a picture like this as it was seconds before it was cut and then it was gone. Congrats to the family and to you for the picture. It has worked really well in available light. It is the 50mm Canon lens you sold me. It is so good, I use it all the time. Grr. There are moments when I wish that I had stayed with Canon but don't miss the weight of the bag!! I think the lighting is A1 and rather supplied you say no flash I see no way it could have been improved I do like the knife on the table.